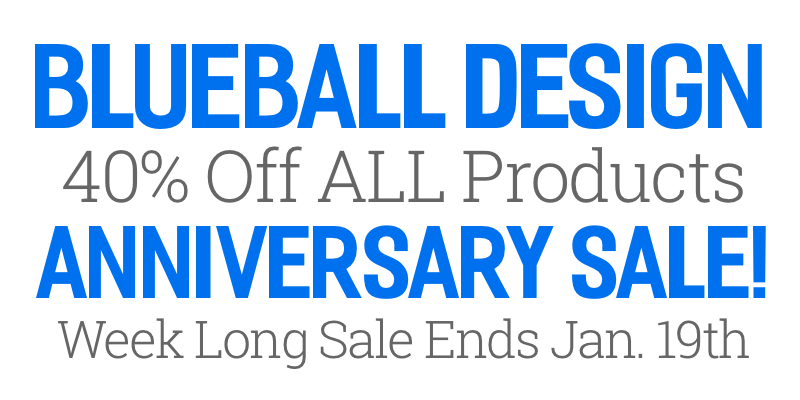 » Huge Blueball Design 12th Anniversary Sale - 40% Off All Products! Huge Blueball Design 12th Anniversary Sale - 40% Off All Products! Blueball Design is celebrating the start of our 11th year selling Sandvox designs with a BIG week long 40% Off Sale! Way back in January 2006 when we released our first Sandvox design did we have any idea that 10 years later in January 2016 we would be starting our 11th year of selling Sandvox designs! As a way of saying thank you to the Sandvox community that has supported us over the years, ALL our Sandvox designs are 40% off for the next 7 days including our Blueball Flexor, Blueball Reactive, and Blueball Simplex responsive Sandvox designs! Thanks again for all your support through the years! It's been a fun and interesting ride with Sandvox, from our first purchase of Sandvox back in late 2005, to the latest version of Sandvox 2.10 and beyond! Re: Huge Blueball Design 12th Anniversary Sale - 40% Off All Products! Just a quick reminder for everyone that our big anniversary sale ends today at 12pm midnight EST US. If you have wanted to pickup one of our responsive Sandvox designs, now is the time to do it! Also wanted to say THANK YOU! for the tremendous response we have received from Sandvox users on our anniversary sale! Very much appreciated. Look for something new from us sometime next week too!